This article is about the 2000 Nelly song, and its remix "Tip Drill". For other uses, see EI (disambiguation). "E.I." is a single by American rapper Nelly. It was released in 2000, taken from Nelly's 2000 album Country Grammar. It peaked at number 11 on the UK Singles Chart and 16 on the U.S. Billboard Hot 100. "Tip Drill," or "E.I. (Remix)  is the name of a 2003 remix of the song. It appeared as the fourth track on his 2003 remix album Da Derrty Versions: The Reinvention. An alternate version featuring vocals from Nelly's group, the St. Lunatics, which is listed as the "Tip Drill Remix", appears as the final track on Da Derrty Versions: The Reinvention. Both versions were produced by David Banner. The song's music video, made for the version featuring the St. Lunatics, became controversial for its overt depiction of women as sexual objects. It was meant to be a single, but withdrawn due to its potentially offensive content. Despite this, Nelly's solo version of the song received moderate airplay on urban contemporary radio stations in the United States and peaked at number 65 on the US Hot R&B/Hip-Hop Songs chart in early 2004. Features cameo appearances by Jermaine Dupri and David Banner. In one interpretation of the song's meaning by Mark Anthony Neal, the phrase tip drill is a "ghetto colloquialism for the proverbial ugly girl with a nice body." In 2004, women's studies students at Spelman College in Atlanta, Georgia protested against misogyny in rap music and "Tip Drill" specifically. The students criticized the negative portrayal and sexual objectification of African-American women in the video, which showed women in bikinis dancing and simulating various sexual acts, men throwing money on women's breasts and buttocks, and Nelly swiping a credit card between a woman's buttocks after which it starts bouncing. Nelly's 4Sho4Kids Foundation was scheduled to hold a bone marrow drive on campus to help his sister who suffered from leukemia. Spelman Feminist Majority Leadership Alliance President Moya Bailey and Leana Cabral named Nelly the "Misogynist of the Month" and the flyers they and other members placed on campus prompted the foundation to cancel the drive. The president of the Student Government, Asha Jennings, said: "Nelly wants us to help his sister, but he's degrading hundreds of us." According to Spelman students, Nelly's Foundation refused to hold the drive unless the university promised that students would not confront the rap star about his song and the video. The Foundation canceled the drive. In 2008, Nelly stated that his own daughter, Chanelle, had never seen the video. ^ a b Birchmeier, Jason. "Da Derrty Versions: The Reinvention – Nelly > Overview". AllMusic. Rovi Corporation. Retrieved October 29, 2012. ^ "US hip-hop film sparks debate on masculinity". Reuters. February 21, 2007. ^ "Nelly - Chart history". Billboard. Retrieved 18 March 2015. ^ a b "Female students spurn Nelly over explicit rap video", The Houston Chronicle, April 25, 2004. ^ "Nelly feels the heat", The Chicago Tribune, April 02, 2005. ^ Arce, Rose. "Hip-hop portrayal of women protested" Archived 2012-04-05 at the Wayback Machine, CNN, March 04, 2005. ^ Bailey, Moya (May 23, 2004). "Dilemma". AlterNet. Retrieved 15 March 2013. ^ Watkins, Samuel Craig. Hip Hop Matters: Politics, Pop Culture, and the Struggle for the Soul of a Movement. Boston, Mass. : Beacon Press, 2005, ISBN 978-0-8070-0986-4, pp. 217-218. ^ "Nelly - It's called adult entertainment", The Independent, July 25, 2008. ^ "Nelly Chart History (Hot 100)". Billboard. Retrieved December 21, 2012. ^ "Nelly Chart History (Hot R&B/Hip-Hop Songs)". Billboard. Retrieved December 21, 2012. ^ "Nelly Chart History (Pop Songs)". Billboard. Retrieved December 21, 2012. 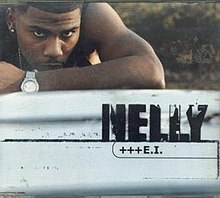 ^ "Australian-charts.com – Nelly – E.I.". ARIA Top 50 Singles. Retrieved December 21, 2012. ^ "Austriancharts.at – Nelly – E.I." (in German). Ö3 Austria Top 40. Retrieved December 21, 2012. ^ "Musicline.de – Nelly Single-Chartverfolgung" (in German). Media Control Charts. PhonoNet GmbH. Retrieved December 21, 2012. ^ "Chart Track: Week 7, 2001". Irish Singles Chart. Retrieved December 21, 2012. ^ "Nederlandse Top 40 – week 14, 2001" (in Dutch). Dutch Top 40 Retrieved December 21, 2012. ^ "Swisscharts.com – Nelly – E.I.". Swiss Singles Chart. Retrieved December 21, 2012. ^ "Official Singles Chart Top 100". Official Charts Company. Retrieved December 21, 2012. ^ "nelly Chart History (Hot 100)". Billboard. Retrieved July 2, 2013. ^ "ARIA Charts – Accreditations – 2001 Singles". Australian Recording Industry Association. Retrieved December 21, 2012.